Header photograph “Olive ridley turtle nesting on Escobilla Beach, Oaxaca, Mexico” by Claudio Giovenzana (www.longwalk.it), CCA-SA 3.0U. Illustration of a flatback sea turtle, native to parts of the South Pacific and Australia. Sea turtles, also called marine turtles, are air-breathing reptiles that have flippers rather than feet and spend most of their lives in the water. Because they lack gills to breathe underwater, sea turtles must hold their breath while sleeping, which some can do for up to seven hours, before surfacing for air. However it is not known whether they hibernate underwater like freshwater turtles. Like tortoises and some species of turtles, sea turtles can retract their head into their shell, a vital defense mechanism. While tortoises can live for over one hundred years in the wild, the lifespan of sea turtles is not well understood, but green sea turtles are able to reach 80 years of age in the wild. There are seven existing species of sea turtle, all of which have varied diets that may include seagrass, lobsters, shrimp, and jellyfish. Some species are capable of diving hundreds of meters (thousands of feet) and remain submerged for several minutes or even several hours at great depths. Sea turtles are also known for their incredible migrations across vast distances to reach their ancestral nesting grounds around on every continent except Antarctica. Adult sea turtles can range in size from around 60 centimeters (2 feet) for the smallest species to over two meters (6.5 feet) in length for the largest. The Olive Ridley is the smallest species, weighing only 25-50 kilograms (55-110 pounds), while the leatherback is the largest at 300-600 kilograms (650-1,300 pounds). Interestingly the leatherback sea turtle is not closely related to the other six species in the superfamily Chelonioidea. One of the most well-known species is the green sea turtle which has Atlantic populations that annually migrate nearly 3,000 kilometers (1,860 miles) from Brazilian coastal foraging areas to the Ascension Island breeding grounds. All sea turtles have this impressive sense of direction and stamina and the leatherback has been observed swimming at over 35 kilometers per hour (21 mph). How sea turtles navigate in the open sea is not known, nor is there a consensus on the way that baby sea turtles, called hatchlings, find the sea from the shore. A common but disputed hypothesis is that they use light from the moon to navigate towards water. Sea turtles have specific, ancestral foraging areas, mating grounds, and nesting beaches. Many female sea turtles return to these beaches to lay roughly 50-200 eggs depending on the species, though most of these will not hatch or the hatchlings will not survive to adulthood. Those that do survive will not reach sexual maturity until 20-50 years of age. 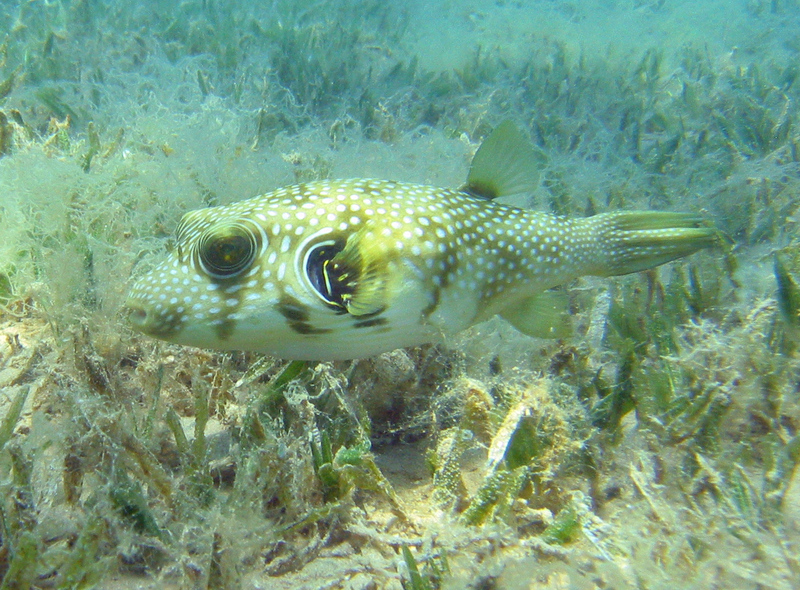 White spotted puffer in a bed of seagrass. Photographed in Dahab, Egypt. Green sea turtles, dugongs, and other species that feed on seagrass, a flowering plant, play a role in the maintenance of the sea floor. 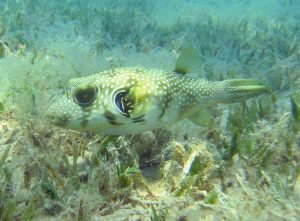 By trimming the tops of the seagrass, the way that domestic sheep and cows graze grass, sea turtles provide a service to other species in the ecosystem which use the seagrass meadows to hide from predators, breed, and shelter their young. Tropical seagrasses also provide an important sediment-reduction function which helps to keep coral reefs clean (pages 6 & 7) and healthy while also reducing beach erosion (page 7). To feed on jellyfish the leatherback sea turtle is known to dive more than one kilometer (0.62 miles), deeper than any other known sea turtle and half as deep as sperm whales. When sea turtles come to shore to lay their eggs they are not only providing a wildlife tourist attraction, but also distributing nutrients into the barren sand. This becomes a vital source of nutrients to the plants that grow on beaches and as a byproduct the beach vegetation stabilizes the sand and reduces erosion. Because beaches are the leading tourist destination in the United States (page 4) for domestic and international tourists and bring in billions of dollars in taxes for states like Florida and California (page 5), the conservation of sea turtles becomes an aspect that benefits both beach preservation and travel and tourism revenue. Loggerhead sea turtle using a TED. The illegal and unsustainable harvesting of sea turtle eggs for food and folk medicine in South America and Asia contributes to already low hatching rates. Destruction of beaches and the use of artificial lighting at night where the sea turtle species have major and minor nesting grounds, mating grounds, and feeding grounds are contributing to the indirect deaths of sea turtles and reducing their opportunities to bear successful offspring. Despite the great numbers of eggs that an individual sea turtle can lay, most eggs will not hatch due to improper conditions, or the hatchling may be buried too deep in the nest to escape. Due to natural and unnatural threats it is estimated that only 1% of hatchlings will reach sexual maturity. On land foxes, monitor lizards, mongooses, raccoons, and other foraging animals present a threat to the eggs. Some predatory and opportunistic birds feed on hatchlings as they move to the ocean. In the water predatory species of fish, including sharks, are a significant threat. Like many reptiles the temperature sea turtle eggs are incubated at is the determining factor in the gender of the hatchlings. As a result of being buried and incubated in sand, changing temperatures of ancestral hatching grounds will impact the balance of males and females, thereby impacting the species’ natural abilities to reproduce and sustain their populations. Factors directly killing sub-adult and adult sea turtles are oil spills; ghost nets, loose or lots nets that drift in the sea; bycatch, the accidental capture of unwanted sea life while fishing; as well as collisions between swimming sea turtles and vessels or their propellers. In recent decades great strides have been made in the conservation of sea turtles and their nesting beaches in North America, particularly in the United States through the Endangered Species Act of 1973 and subsequent amendments. Other laws such as the Indian Wildlife (Protection) Act of 1972, and two sea turtle-specific international environmental agreements, have also improved the protection of marine turtle habitats and populations. All seven sea turtle species are also listed But laws alone have not been able to reduce bycatch, poaching, and habitat destruction. 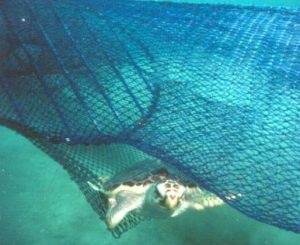 Innovations like the turtle excluder device (shown right) have even come into use by some fishers which have helped reduce the bycatch, or accidental catch, of sea turtles and other sea life that they are not licensed to fish for. Sea turtle conservation projects in sea-side communities have brought people together to conserve both sea turtles and the beaches that humans love to visit. Eco-tourism and “voluntourism” focusing on sea turtles has also benefited the species and local communities that host tourists visiting during egg hatchings and migrations. Some tourists can also provide a small donation for the opportunity to have direct involvement in research and conservation programs alongside wildlife professionals.